We might still be waiting for the sun to appear after just having experienced one of the wettest June’s on record, but here at Carr & Westley we’re still very much in the summer spirit! To help you prepare for some (hopeful) warmer weather ahead, we’ve chosen our top 10 outfits from our new 2016 Summer collection. As with all Carr & Westley own-label and branded products, our garments are available in a variety of lengths and sizes. SUNSET PALM TOP (Now £22) paired with SUNSET PALM SKIRT (Now £32). STEP NECK TOP (£24) paired with GROOMBRIDGE TROUSERS (£56). TULIPA CAMISOLE & SCARF (£50) paired with TULIPA SKIRT (£60) - buy the set for £90 and save £20. This entry was posted in British Manufacturing, Classic Clothing, Poppy, Company, Summer Catalogue on July 4, 2016 by Harry Burton. Here at Carr & Westley, we’re very proud of our heritage as a small, independent family-run British business. The company was established way back in 1919 in Holborn, London and we moved out to the countryside in the early 1940s to escape the Blitz during World War 2. Our home now is Bourne Mill - an 11th century watermill in the Kentish countryside and where our team of seamstresses custom make Carr & Wesley branded clothing. All Carr & Westley garments are designed with our customer in mind - high-quality, easy-fitting and hardwearing, but without compromising on style and feel. This entry was posted in British Manufacturing, Classic Clothing, Company History, Company on May 3, 2016 by Harry Burton. At Carr & Westley we take pride in being one of the last bastions of British manufacturing. Our skirts and dresses have been made in this country since 1919 and home-based manufacturing is a legacy we are proud to uphold in today’s heavily outsourced world. From our workrooms in Kent, we still put the same passion and detail into the production of our clothes as we did 90 years ago. To give you an insight into how our manufacturing process works, we’ve put together this short article that details the production process of a Carr & Westley skirt – from conception to the wardrobe. 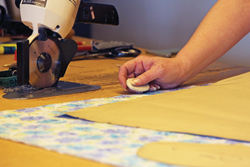 The first part of the skirt manufacturing process is creating a design. Our designer will sketch out a number of rough designs for the new season and these will be made up into product samples. With a range of product samples to choose from, our designer and management team will select five or six designs that they want to put into production and include in the next catalogue. The chosen design of a skirt is influenced by a number of factors. The most influential of course being seasonality. Summer skirts are usually designed from lighter material with flared hems and rarely feature pockets to maintain smooth lines. Winter skirts are more robust and many are designed with full linings for warmth and comfort. Once the design of the skirt has been finalised, we have to decide which material to make it from. Taking the finished skirt design, our production team undergo ‘material sampling’. Material manufacturers from all over the country send us fabric samples in 6x6 inch squares. These samples come in a variety of patterns with different fibre contents and washing instructions. We can receive up to fifty different samples before we whittle down to three or four for each design. The materials we choose for sampling are determined by a number of factors. First and foremost, we want it to look good. Is the pattern right for the season? Is it a unique and distinctive design? Next, we need to make sure that its weight, fibre content and texture is suitable for the time of the year. Summer skirts are generally made from light material like cotton. Winter skirts a denser, wool-heavy material. With three or four sample fabrics chosen, we make up a working prototype of the product. From the different fabrics, we can observe how the material looks, sits, stretches, washes and endures through everyday use. At the end of this testing phase we choose a final material and put the design into production. Once a skirt design has been approved and a final sample made up, we have to photograph it for our catalogue. The catalogue production team will take the sample out on location for what we call ‘lifestyle photography’. After lifestyle photography, we then shoot the product again in our studio against a white background for inclusion on the website and examples of all available colour ways. With the skirt photographed and included in the catalogue and website, it awaits its first customer order. When a customer orders the new skirt online or via the phone, a product ticket is generated in our workrooms. This tells the manufacturing team which model has been ordered and in which size, colour and length. The ticket is passed to our team in the cutting room where the first stage of manufacture happens. From the order received our cutting team have to select the correct material and then cut chosen dimensions from the roll. The material is cut from design specifications which can mean marking out and then trimming a number of separate panels, accounting for pockets and additional design features. If the skirt design includes a lining, this will also be cut here alongside the main material. 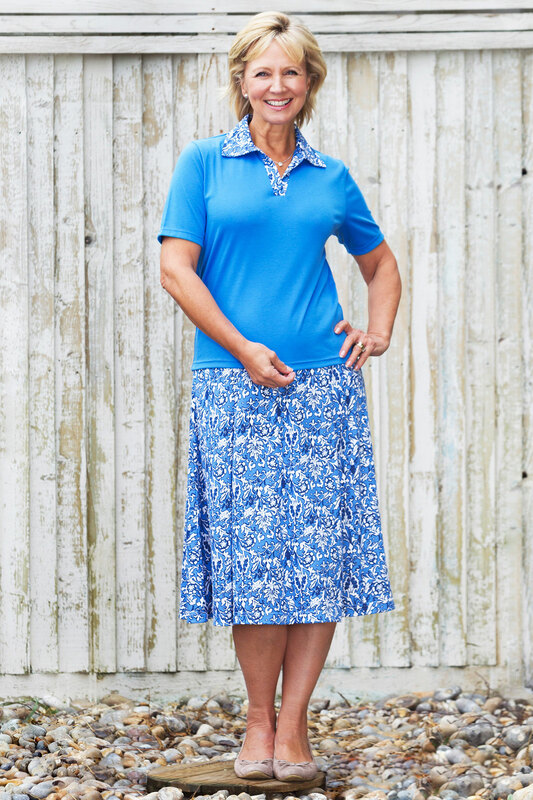 Unlike many other manufacturers, all our skirts are made to order. This means that when a skirt order comes through, we actually make it from scratch. This process is not efficient, especially by today’s automised standard, but it is traditional and allows a flexibility not granted by other manufacturers. It allows us to offer five different skirt lengths – a real rarity in today’s clothing trade. Once the panels, pockets and other features of the skirt have been cut they are passed onto the stitching department. This is where the pieces are put together like a jigsaw. In the stitching room, we sew the skirt panels together and adjust the waistband and hem to specification. If the model includes them, pockets are finished here along with other design features. Finally, the C&W label is sewn in along with the product size label and fibre content. With all the components of the skirt pieced together, it is pressed, packed and ready to send out to the customer. We have to work as a team throughout the manufacture of a Carr & Westley skirt. Many of our workroom staff have been with the company for a long time and have formed strong personal bonds because of it. We believe that these relationships and our respect for traditional manufacturing techniques have helped us maintain a unique level of quality. We are proud of our team and proud to be different. Click here to see a range of Carr & Westley made products. This entry was posted in British Manufacturing on October 10, 2013 by admin. Happy new year from all the staff at Carr and Westley. We enjoyed a wonderful perfromance on Christmas eve in Hadlow Village square by the salvation army band. A wonderfull ocasion enjoyed by all the family. We have all had a good rest and are ready and waiting to help you find a bargin from our January Sale catalouge. The cold weather will be with us for a few months yet, meaning you'll get fantastic winter wear for now and next year. As tradition, all Carr and Westley goods come with a "look good, feel good" guarantee - if your not 100% satisfied, we will give you a refund. No questions, no quibble. And if you like icing on your cake, we'll point out that all Carr & Westley orders come with Free UK Delivery. Not a lot of company's can say that - so we do, often. This entry was posted in British Manufacturing on April 1, 2013 by admin. Have you ever wondering how clothes get their colour? More often than not it comes from a dye added to the material during the early stages of manufacturing. We’ve written a short article which explains one method of dyeing material and how it is used to colour garments of different types. A dye is a coloured substance that has a chemical affinity to another substance – in this instance, material. There are two types of material dye, natural or man-made. Pre-19th century the only option for colouring material was to use a natural dye. These dyes were derived from plants, invertebrates or minerals. During this time the most common form of natural dye came from plant roots, berries, bark, leaves, wood, fungi and lichens. In the late 19th century, however, the first synthetic dye was invented and these are now widely used in the colouring of material. 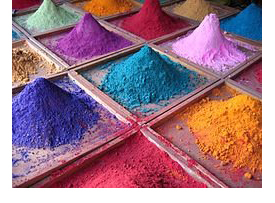 Man-made dyes are formed from different chemical compounds, the most popular being the Azo types. In mass manufacturing, synthetic dyes have become very popular due to their low production cost and easy manipulation. The broad range of colour in clothing manufacture has become possible thanks to synthetic dye. In reality there are many different techniques available for the application of synthetic dyes to fabric. It is usually dependant on the type of fabric you are dying. A common method for applying dye to material however is by using a mordant. A mordant is a chemical substance used to help set dyes on fabrics by forming a “coordination complex” with the dye which then attaches to the material. The term mordant derives from the French term mordre, which means "to bite". Types of mordants include tannic acid, alum, urine, chrome alum, sodium chloride, and certain salts of aluminium, chromium, copper, iron, iodine, potassium, sodium, and tin. The process for dying material with a mordant happens in three stages. Pre-mordanting (onchrome). This is where a fabric is initially treated with a mordant on its own e.g. soaked in tannic acid. Meta-mordanting (metachrome). The next stage is to add the mordant to the dye bath. The material is then soaked in the dye bath. Post-mordanting (afterchrome). The final stage of the process is where the newly dyed material is again treated with a mordant to ensure the dye takes to the material properly. The type of mordant used in the manufacture process affects the shade and fastness of the dye. After the application of dye the material is treated with extra chemicals for stain resistance, texture and anti-pilling protection etc. The application of dye, natural or synthetic, is what gives our garments an almost indefinite range of available colours. The mixing of different pigments creates a rich blend of tones that we see popularised through the different seasons of the year. This entry was posted in British Manufacturing on May 10, 2012 by admin. Before the textile revolution of the mid 18th century, clothing in the United Kingdom was a cottage industry. Most garment wear in Medieval Britain was influenced by either Scandinavian invaders or the Roman Empire. The rich would wear imported silk, linen and patterned wool. The poor would wear local or homespun wool - often without colour and edged with hand embroidery or tablet woven bands. By the 13th century, however, the dying and working of wool had progressed and there was also more common use of linen in simple clothing. Yielded from the flax plant, this linen was laundered and bleached in the sun to provide linings and cotton, imported from Egypt, was also used for padding and quilting. By the mid 14th century clothing was becoming increasingly tailored with curved seams, lacing and buttons. The manufacture of wool became more sophisticated, creating a broadcloth with a velvety nap and dyed in rich colours – still within the cottage industry. As prosperity grew more complex clothing followed. By the 17th century 'point lace' became popular in England, reflecting floral patterns of that period. The Industrial Revolution brought about a huge change in how clothing was manufactured in the United Kingdom. The textile industry was one of the first to be mechanised. Recently built canals, railways and roads aided trade expansion and the workforce swelled as people came in from the countryside to towns and cities. Steam power, the use of coal and water wheels aided the new machinery, and a boom in production followed. This increase in productivity was aided by a number of well known inventions. 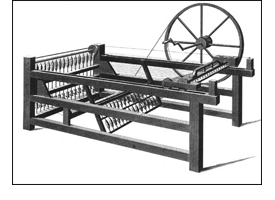 Richard Arkwright's Water Frame, James Hargreaves' Spinning Jenny and Samuel Crompton's Spinning Mule (a combination of the Frame and Jenny) were some of the first machine powered devices to spin cotton. Dedicated cotton mills followed with many areas of the Midlands becoming synonymous with textile production. Cities like Derby (still home to one of our suppliers Slenderella) became important in the manufacture of clothing in Britain. In the following years, machines similar to the Frame, Jenny and Mule spun worsted yarn and flax for linen. The Flying Shuttle, patented in 1733 by John Kay, vastly improved the process of weaving. Shuttle boxes at each side of the loom, connected by a long board (shuttle race) enabled the shuttle to be knocked back and forth at great speed, with the aid of cords attached to a picking peg. After a shaky start in 1785, the Power Loom (Edmund Cartwright) mechanically wove cloth onto a beam at the back of the loom. By 1850 there were 250,000 power looms in Britain, more than half were located in Lancashire. 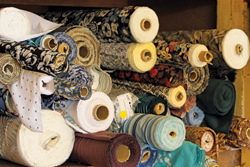 Meanwhile, new textiles were coming through including viscose, nylon and polyester providing the opportunity for greater versatility and choice. Textile production peaked in England in 1926. The outbreak of the First World War meant that cotton could no longer be exported to foreign markets and countries like Japan set up their own factories, with cheaper labour. Once the mills were decommissioned, much of the machinery was sent to India and China to aid development. Over the second half of the 20th century there was huge expansion of textile production within these countries. During the Second World War there was a short reprieve of textile production in Britain as factories produced uniforms and parachutes but this was short lived as once the war was over, Britain could no longer compete with cheaper overseas manufacturers. At present, the UK clothing industry employs around 140,000 people. Over the years, many UK manufacturers have struggled to compete and sadly fallen by the wayside. For those that have survived, many now outsource their production overseas to countries like India and China. These firms have now simply become marketing ‘fronts’ as no production actually occurs on home soil. However, there are a few firms that still manufacture in Britain, Carr & Westley being one of them. We have been employing the same techniques for almost 100 years. We pride ourselves on providing traditional clothing styles without compromising on quality. We hope that, in this time of austerity, more clothing companies move their operations back home because profit isn't everything. We are proud of our heritage, and proud to be British. To see a range of our British Made Clothing visit the Carr & Westley brand page. This entry was posted in British Manufacturing on April 10, 2012 by admin. No one can sew anymore - for a country with a heritage of seamstresses, you wouldn’t believe how difficult it is to find people that can sew! Many of our workers learnt to sew many years ago when they were at school. Now, whenever we have a staff member who leaves (or retires!) finding a ready-made replacement is increasingly difficult. Today, textiles is taught less in schools and many young people don’t have the motivation or will to learn this important skill. The loss of in-house employees has created a logistical nightmare – We used to employ up to 25 on-site factory staff – now we have 10. The loss of in-house employees has been supplemented by the use of remote workers but this itself creates a new type of problem. Every couple of days our factory manager has to complete a 60 mile round trip delivering the raw materials and collecting finished products from those in the surrounding towns and villages. This puts a significant strain on management resources. We train up apprentices and then they leave - In the past we have run apprenticeships for youngsters – but the time needed to train them to be effective workers simply isn’t available. We spend six months building up their skills only for them to then leave for a job in a local supermarket. British raw material suppliers are disappearing – With the general decline of manufacturing in Britain and the state of the economy, getting hold of the raw materials needed to make our products has become increasingly difficult. The frequent disappearance of material suppliers makes forecasting hard and lead times for receiving goods are getting longer too. We now have to have a contingency for everything – but it’s not all bad. Situations like this open your eyes to things that need to change if you are to grow in the long run. As a result we’ve become more efficient managing stock and forward planning. Managing costs is a significant problem – The world has gone global, and even though we manufacture our products in Britain, often the raw materials have to come from somewhere else. Events such as the flooding in Bangladesh, which severely affected the price of cotton, is just one example of circumstances outside our control which have a knock on effect on costs. The reality is that manufacturing in Britain is a shrinking industry. You’re never sure whether something you were expecting to be there tomorrow will exist by the time you need it. We know not to take things for granted and we plan for all circumstances. The company has been around for almost 100 years and has seen worse times than this. We’re still here, adaption is key, and we’ve become stronger because of it. Chris Brinklow is Head of Production at Carr & Westley, a family-owned British manufacturing business making classic womenswear. This entry was posted in British Manufacturing on April 26, 2019 by admin. Did you know that with every C&W made product you are not only supporting British manufacturing, but buying into a little bit of history. In this post I have in inculded an article from the Tonbridge Courier from March 31, 1967. 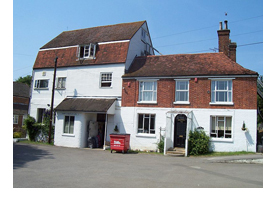 Bourne Mill is located in the village of Hadlow, deep in the Kentish countryside. Pre-dating the 15th cenury, it was originally built for processing cereals to make flour and bread. Now its used as the Carr and Westley workshop where we design and make our skirts, trousers and dresses. We've been here for over 70 years and can't imagine working anywhere else. 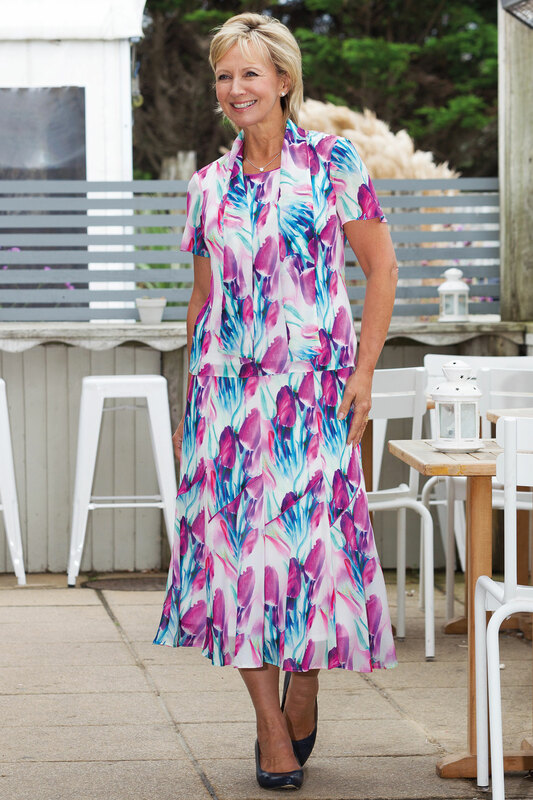 In our Spring into Summer catalogue, we've blended a rinage of C&W garments with a hand-picked selection of label brands like Poppy, Brandtex and Slenderella. You'll find favourite designs mixed with new styles available in a range of colours. The last place one would expect to find a “rag trade” factory is in a country mill where corn was ground in the 11th century. 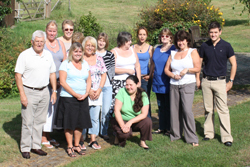 For the last 11 years clothing of a special kind has been made at Bourne Mill, Hadlow. The mill was built in the late 11th century and was used to grind and crush corn until just after the Second World War. The old grinding stones can still be seen outside the mill, which straddles the River Bourne. Twenty five girls are employed by Carr and Westley Ltd., a firm owned and run by Mr Laurie Brinklow and his wife who live at the mill. Mr Brinklow started with the firm in 1956 as an administrator. Within six weeks he had been asked to take over the firm, though, as he freely admits, “I knew nothing about the rag trade”. The firm started in 1918 in East London but moved to St Ives, Cornwall when it was bombed out in the Second World War. In 1948 Mr Harold Carr, the founder, discovered the Bourne Mill site and moved his factory to Hadlow. The original mill machinery had to be moved out and sewing machines and cutting boards installed. Local girls were recruited and given an intensive training. Mr Brinklow says he has been fortunate in that most of the girls have stayed with the firm. The dresses and clothing he supplies are for the more mature women who cannot get off-the -peg cloths even at the most expensive clothes shops. He prides himself that his firm can provide made-to-measure garments at off-the-peg prices. We deal with the steady end in the trade that does not fluctuate with fashions. We concern ourselves with providing good clothes and, because of that, we have built up our business and acquired a good reputation says Mr Brinklow. We are now able to compete favourably with many West End stores though we have no representatives or shops to attract custom. Each year estimates Mr Brinklow, the firm produces about 10,000 garments, all hand made. ”Our customers like to stick to conventional designs, but they like to wear new materials”, he says. Mrs Brinklow was as new to the trade as her husband when they moved to the mill but she is now responsible for most of the designs in the catalogues issued by the firm three or four times a year. Perhaps the most surprising feature of the business is that 35 – 40% of the trade is from the south and London where competition from the dress makers is at its greatest. Mr Brinklow even has clients in London’s Park Lane who prefer the Hadlow styles to those of the country’s leading shopping centre. Bourne Mill has certainly gone from rags to riches.